Brass Tacks offer a full service for the reproduction and refurbishment of brassware. For more information call 0208 866 8664. Brass Tacks can replicate brassware to match original items. 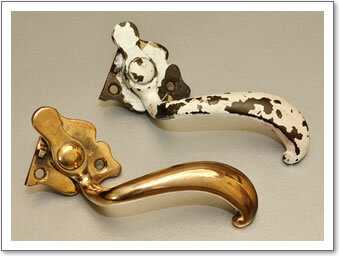 We can either fabricate from solid brass or cast from a pattern. Many skills we use today date back to the 18th Century. We have previously made Victorian mortice knobs for the Grand Tier Boxes in The Royal Albert Hall, made grilles for Jaguar cars and have recently replicated over 200 window fittings for a residential property in Kensington. The image below shows a casement stay original, the castings produced and the finished item supplied in a bronze finish. Over the years brass will tarnish or sometimes get painted. We are able to strip back any lacquer or paint and bring items back to their former glory. We have polishing and lacquering facilities at our factory in West London and can complete all refurbishment work in house. We have previously refurbished all the window fittings for County Hall London, home of The London Aquarium. The image above shows a casement fastener as it arrives with us covered in paint and an identical handle stripped, polished and lacquered.